It's no surprise that many 2017 Acura MDX reviews call the luxury crossover "the best in its class." With impeccable style, excellent engineering and all the latest safety and tech features all at a respectable price, the MDX is a total knockout. This model year brings quite a few updates, including the much-anticipated MDX Sport Hybrid which adds a more fuel-efficient option to the line-up. Whether you are looking for something sleek and powerful, a sizeable 7-seater that can handle a big family or an SUV that loves adventure, the MDX is sure to fulfill your every need and then some. The 2017 Acura MDX in Peoria receives exterior refreshments that help to maintain its reputation for being one of the sleekest SUVs on the market. The new diamond pentagon grille, sculpted front fenders, redesigned hood and chrome rocker panels, among other updates, give the MDX a sharper, futuristic look. 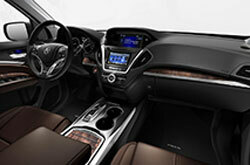 The MDX's cabin is clean, modern and easy to navigate. Plush leather seating, 8-way power seats in the front, three-zone climate control and four USB ports all come standard. 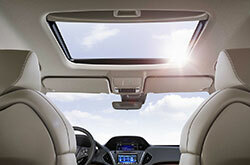 The SUV offers plenty of storage space, as well as cup holders in all three rows. Additional packages offer second-row captain's chairs with a center console instead of a bench seat. Passengers will easily keep entertained thanks to the dual-screen infotainment system, which is powered by the latest version of AcuraLink that offers SiriusXM and Bluetooth capabilities in addition to an optional Siri Eyes Free app. 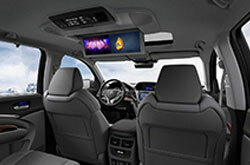 Single and dual-screen rear entertainment systems for the backseat are also available. 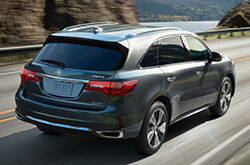 Non-hybrid MDX models are powered by a 3.5-liter V6 engine that generates 290 horsepower and 267 lb.-ft. of torque. The 9-speed automatic transmission gives the SUV a wide gear ratio with fast acceleration. 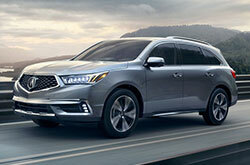 Standard, the MDX comes with front-wheel drive, but it is also available in a unique all-wheel-drive system that moves torque front-to-back and side-to-side for improved drivability. The new MDX Sport Hybrid SH-AWD features a 3.0-liter V-6 with a 7-speed dual-clutch transmission and a three-motor hybrid system. Altogether, the system generates 325 horsepower, making it one of the more powerful hybrid SUV options. The AcuraWatch safety and driver-assistance technology suite comes standard on all models of the 2017 Acura MDX near Phoenix. AcuraWatch includes a smart cruise control, collision mitigation braking system with automatic emergency braking, forward collision warning, lane departure warning and lane keep assist. Through radars and cameras, the MDX can detect lane markings in addition to other vehicles, which allows it to add steering input and adapt to the speeds of surrounding vehicles. The MDX also features an electric parking brake with automatic hold which adds an extra layer of safety when the vehicle is stopped. 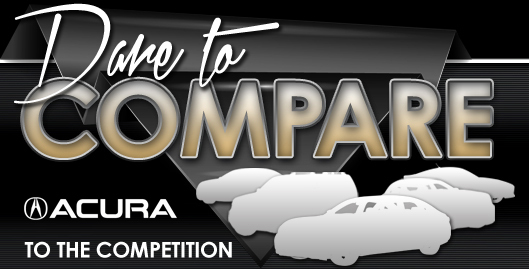 Which Acura Has 3rd Row Seating? 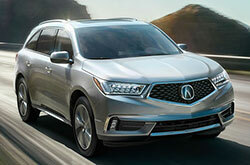 Can the Acura MDX Tow? The Acura MDX Is on Site! Find out why people on the lookout for new vehicle models near Phoenix consider the well-liked 2017 Acura MDX over the 2017 Audi Q7, Volvo XC90 and the Infiniti QX60. Chances are that it perfectly suits your everyday requirements, with its bounty of features and eye-catching design from front to back. Now that you're about wrapped up with our 2017 Acura MDX review page, make sure to check out current lease incentives offered at Acura of Peoria! Among our broad range of cars, the Acura MDX is a popular option at our Acura dealership. When selecting a car, it's imperative to make a responsible choice; that's why we've included this 2017 Acura MDX review ideally suited on our site. Stop by to love a test drive at Acura of Peoria, where you can get to know the Acura MDX for yourself. View the embedded video walk-around to see its cabin amenities before visiting! Purchase prices do not include tax, title, license and $395.00 doc fee. Prices include listed incentives. Please verify all information. We are not responsible for typographical, technical, or misprint errors. Inventory is subject to prior sale. Contact us via phone or email for more details. *19/27 mpg rating for standard V6 front-wheel drive models. Based on 2017 EPA mileage ratings. Use for comparison purposes only. Your mileage will vary depending on driving conditions, how you drive and maintain your vehicle, battery-pack age/condition, and other factors.